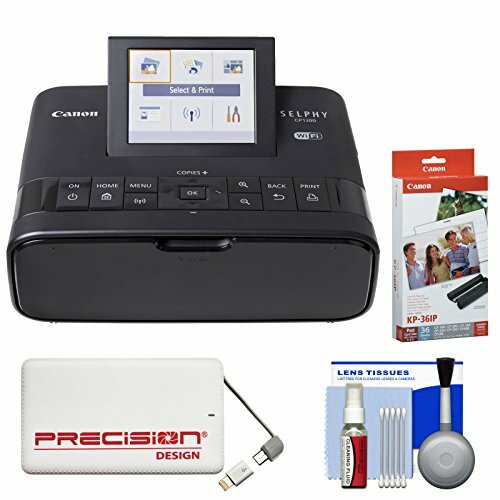 The Canon SELPHY CP1300 Compact Photo Printer captures your memories anywhere you go -- simply connect it to your computer, smartphone, memory card, or USB flash drive for a fun and convenient way to print anytime. Choose from a variety of dimensions up to 4 x 6". Download the Canon PRINT Inkjet/SELPHY app to print your favorite Facebook and Instagram photos directly from your mobile device. The dedicated Wi-Fi button provides fast wireless connectivity, offering an impressive print speed of up to 47 seconds per print. Experience high-quality, portable printing with the Canon KP-36IP Color Ink / Paper Set 4x6 in (36 Sheets). Exclusive to select SELPHY CP compact photo printers, the KP-36IP makes printing borderless Postcard size photos easy and fun. The ink and paper are in one cartridge! So, when it's time to replace the paper it's also time to replace the ink. Each set allows you to print 36 postcard size photos. Elegantly designed, the Precision Design 5000mAh Power Bank Portable Charger charges your devices quickly and safely via the USB cable. With its built-in micro USB cable with Lightning connector, it has everything you need! Works with iPhone, iPad, Samsung Galaxy, Android, other smartphones, game controller, tablet, iPod, digital camera and other digital devices. View More In Inkjet Printer Ink.